#CamptonCX is back, brought to you by Training Bible Cycling, Bicycle Heaven. 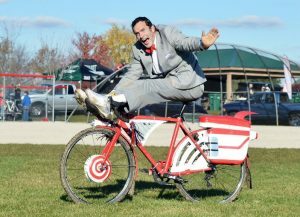 Campton is one of the original ChiCrossCup races and the best Halloween party on two wheels. Anderson Park in Campton Township (5N180 Brown Rd, Campton Hills, IL 60175). There are other Anderson Parks in the Chicagoland area, so please go to the correct one. Preliminary staging will be posted here on Friday. Kiddie Cross is on at 2pm! New food vendor this year. Fernando’s Street Kitchen. Tacos, quesadillas and drinks. The annual Costume Contest as judged by Rob Kelley is on again. We can’t wait to see what the Beverly Bike team has in store for this year. Note PeeWee is Tony Rienks. Weather; the forecast is 50% clear, but will be chilly again in the morning. There is plenty of parking on site. Please do not ride or drive on the grass surrounding the course. The course: Running anti-clockwise with many of the traditional rad Campton features. Note the purple route on the map will likely be use for the Junior 9-14’s and Cat 4/5’s. As always the final route could be different on Sunday. Your search for CamptonCX doesn’t have any recent results. Perform a full search on Twitter to see all results.